William Jennings Bryan stepped from the Owl train to be greeted by a long-waiting crowd. From the Arcade Station, Bryan and his wife were transported by auto to the home of Nathan Cole on Pasadena Avenue. They took the Mt. 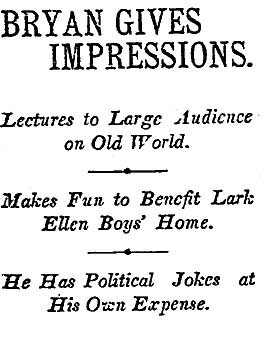 Lowe railway and in the evening, he addressed a capacity audience at Simpson Auditorium in a benefit for the Lark Ellen Home for Boys. The next day, there was a trip to Santa Catalina Island for the Bryans and 100 guests, followed by banquet hosted by local Democrats. Before leaving for Salt Lake City, he addressed the students of Polytechnic High School and attended a reception at the Chamber of Commerce. Eighteen years later, Bryan and Clarence Darrow met in Dayton, Tenn., for the Scopes Monkey Trial. He died two days after the trial’s conclusion. This entry was posted in 1907, Black Dahlia, Books and Authors, Education, LAPD, Pasadena, Streetcars. Bookmark the permalink.